A list of causes of chronic renal failure, together with their relative frequencies in European patients starting dialysis, is given in Table 9.23. In the early stages, a specific diagnosis is often possible but with near end-stage renal failure with small kidneys a specific diagnosis is often impossible even with a renal biopsy. Hypertension is frequently found, but whether this is the cause or the result of the renal disease is often impossible to determine. At first presentation it is often impossible to determine whether a uraemic patient has acute or chronic renal disease. • Myoclonic twitching Severe depression of glomerular filtration can result in oliguria. This can occur with either acute renal failure or the terminal stages of chronic renal failure. However, even if the GFR is profoundly depressed, failure of tubular reabsorption may lead to very high urine volumes. For instance, a GFR of 5 ml rnin ” without any tubular reabsorption would produce a urine output of 300 ml hour-lor over 7litres a day! Because tubular dysfunction always accompanies glomerular disease to some extent, the urine output is therefore not a useful guide to renal function. An assessment of the central venous pressure, skin turgor, blood pressure both lying and standing, and peripheral circulation should also be made. The major symptoms and signs of chronic renal failure are shown. HAEMATURIA may indicate glomerulonephritis but other sources must be considered. Haematuria should not be assumed to be due to the presence of an indwelling catheter. 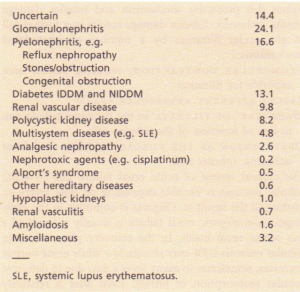 PROTEINURIA is strongly suggestive of glomerular disease, but may occur with tubular disease. Urinary infection may also cause proteinuria. GLYCOSURIA with normal blood glucose indicates tubular disease (failure of tubular reabsorption of glucose). WHITE CELLS in the urine usually indicate active bacterial urinary infection, but this is an uncommon cause of acute renal failure; sterile pyuria suggests papillary necrosis (see p. 461) or renal tuberculosis. EOSINOPHILURIA is strongly suggestive of allergic tubulo-interstitial nephritis. Symptoms and signs of chronic renal failure. GRANULAR CASTS are formed from abnormal cells within the tubular lumen, and indicate active renal disease. RED CELL CASTS are highly suggestive of glomerulonephritis. RED CELLS in the urine may be from anywhere between the glomerulus and the urethral meatus. 24-HoUR CREATININE CLEARANCE IS useful III assessing the severity of renal failure. MEASUREMENTS OF URINARY ELECTROLYTES are unhelpful in chronic renal failure. The use of urinary sodium in the distinction between prerenal and intrinsic renal disease is discussed. URINE OSMOLALITY is a measure of concentrating ability. A low urine osmolality is normal in the presence of a high fluid intake but indicates renal disease when the kidney should be concentrating urine, e.g. in hypovolaemia or hypotension. URINE ELECTROPHORESIS is necessary for the detection of light chains, which can be present without a detectable serum paraprotein. SERUM ELECTROPHORESIS should be performed for myeloma. SERUM LDH -acute elevation occurs in renal infarction due to embolism. EXTREME ELEVATIONS OF CREATINE KINASE and a disproportionate elevation in serum creatinine compared to urea suggest rhabdomyolysis. EOSI NOPHILIA suggests vasculitis, allergic tubulointerstitial nephritis, or cholesterol embolism. RAISED VISCOSITY OR ESR suggests myeloma or vasculitis. FRAGMENTED RED CELLS AND/OR THOMBOCYTOPENIA suggests intravascular haemolysis due to accelerated hypertension or haemolytic uraemic syndrome. TESTS FOR SICKLE CELL DISEASE should be performed when relevant. AUTOANTIBODY SCREENING is useful in detection of SLE , scleroderma (see p. 403), Wegener’s granulomatosis and microscopic polyarteritis and Goodpasture’s syndrome (see p. 451). CRYOGLOBULINS should be sought in patients with unexplained glomerular disease, particularly mesangiocapillary glomerulonephritis. URINE CULTURE should always be performed. EARLY-MORNING URINE SAMPLES should be cultured if tuberculosis is possible. 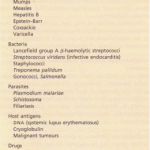 ANTIBODIES TO STREPTOCOCCAL ANTIGENS (ASOT, antiDNAase B) should be sought if post streptococcal glomerulonephritis is possible. ANTIBODIES TO HEPATITIS BAND C may point to polyarteritis nodosa or membranous nephropathy (hepatitis B) or to cryoglobulinaemic renal disease (hepatitis C). ANTIBODIES TO HIV raise the possibility of HIVassociated glomerulonephritis. MALARIA is an important cause of glomerular disease in the tropics. ULTRASOUND. Every patient should undergo ultrasonography (for renal size and to exclude hydronephrosis), and plain abdominal radiography and renal tomography to exclude low-density renal stones or nephrocalcinosis, which may be missed on ultrasound. INTRAVENOUS UROGRAPHY is seldom diagnostic in advanced renal disease. C T is useful for the diagnosis of retroperitoneal fibrosis and some other causes of urinary obstruction, and may also demonstrate cortical scarring. This should be considered in every patient with unexplained renal failure and normal-sized kidneys, unless there are strong contraindications. If rapidly progressive glomerulonephritis is possible, this investigation must be performed within 24 hours of presentation if at all possible, to guide immunosuppressive treatment. ACUTE OR CHRONIC RENAL FAILURE? Distinction between acute and chronic renal failure depends on the history, duration of symptoms and previous urinalyses or measurements of renal function. 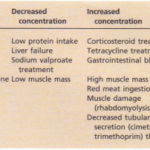 The rapid rate of change of urea and creatinine with time suggests an acute process. A normochromic normocytic anaemia suggests chronic disease, but anaemia may complicate many of the diseases which cause acute renal failure, due to a combination of haemolysis, bleeding, and deficient erythropoietin production. The ultrasound estimation of renal echogenicity and size is helpful. Small kidneys of increased echogenicity are diagnostic of a chronic process, although the reverse is not always true: the kidneys may remain normal in size in diabetes and amyloidosis, for instance. 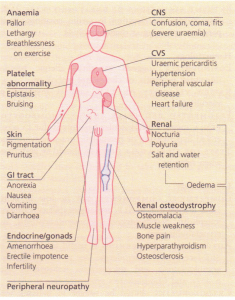 Renal osteodystrophy suggests chronic disease. The measurement of carbamylated haemoglobin (product of non-enzymatic reaction between urea and haemoglobin, cf. glycosylated haemoglobin) is not yet widely available.